Mondi has developed a fully-recyclable plastic laminate for pre-made pouches and FFS roll stock that is perfect for integration into existing recycling schemes. BarrierPack Recyclable has been validated for existing industrial recycling streams. Sustainable plastic packaging is evolving faster than the general understanding of the related materials and recycling issues. Industry-wide initiatives are driving the development of recyclable packaging for a circular economy that maximises the lifecycle of plastic and minimises its ecological footprint. 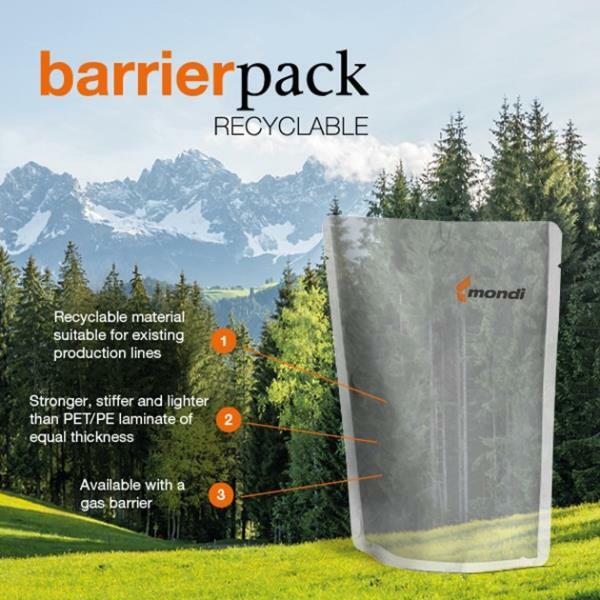 BarrierPack Recyclable, an award-winning new plastic laminate for pre-made pouches, provides positive environmental outcomes and value creation through a sustainable material with performance properties equivalent to conventional materials. It was developed in direct response to the need to reduce plastic waste without compromising on quality or functionality, and it supports the circular economy. Barrierpack Recyclable is available for all horizontal and vertical FFS applications. In addition, it can be further processed into customised converted packaging solutions. Mondi recently spun off a new, paper-based line of dog food packaging based on its FlexziBox concept, which until now had been entirely plastics-based. Longtime Mondi customer MERA Tiernahrung GmbH, a socially minded, mid-sized family company in Kevelaer, Germany, supplies private-label pet food to the German retailer Fressnapf Tiernahrungs GmbH. 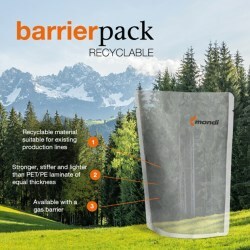 Mondi and Werner & Mertz are ready to release a new, 100% recyclable pouch made of polyethylene. Mondi Group, a global leader in paper and packaging, has joined the Pressure Sensitive Tape Council (PSTC), the leading North American trade association for release liners, and is fully committed to further supporting its existing assets and presence in the region’s tape industry. Mondi partnered with technical university to take a smart approach to innovation in the packaging and paper industry by challenging 50 of the brightest minds to apply big data to solve industry challenges. Mondi launches new promotion with top prize a trip to Kennedy Space Center in Florida. Today’s consumers are drawn to unusual and appealing packaging designs and formats that stand out. Inspired by this trend, Mondi has recently created a special 3D varnish with haptic effects for enhanced shelf appeal at point of sale. As a result of its customer focused research and development, Mondi’s technical films business has created and introduced a water soluble film for the smart and convenient packing and dosing of powders, tabs and granulates. Dissolving completely in water, the film is ideal for single doses of dry materials, such as dishwasher and laundry tabs or bath salts. Organised by the Non-profit Food Initiative for Austria (GLi) and the Hygienicum institute, the 3rd Symposium for Food Safety took place in Graz, Austria, from 6th to 7th April 2017. A strikingly original new swatch book for Mondi’s BIO TOP 3®, designed with the needs of creative industries in mind, is now available in Europe. Global food waste is a serious problem – one that is being tackled by the collaborative efforts of the food and packaging industries and local and global initiatives. Mondi, the international packaging and paper Group, is playing an active role in addressing this challenge through its expertise in food safety and innovative packaging. Mondi, the international packaging and paper Group, will show how its packaging solutions are addressing current trends at interpack – the world’s largest trade fair for the packaging industry. Consumers today are sophisticated and demanding. They prefer packaging that is convenient and that helps them make a buying decision. According to a survey from the market intelligence agency Mintel on Packaging Trends 2017, today’s consumers are also attracted by packaging that stands out through unusual and pleasing design, texture or innovative features. Mondi, the international packaging and paper Group, supplies the automotive and automotive parts industries not only with a variety of customised packaging and specialised paper, but also with high-tech automotive interior materials made from extrusion coated multilayer complexes. At the FachPack trade fair on 27-29 September in Nuremberg, Germany, Mondi will show its extensive range of state-of-the-art solutions for the automotive and other industries. Mondi Containerboard highlights its full range of highly functional papers for packing fruit and vegetables. 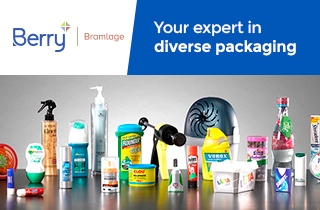 Whether for high-humidity environments, hot temperatures or cold storage, the ProVantage and EcoVantage product ranges suit all these conditions perfectly. The line features ample selection, offering 12 different paper grades. 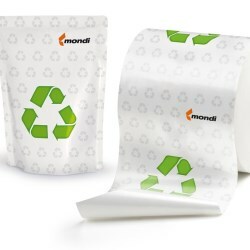 In 2012, Mondi Kraft Paper has added a new paper grade, Advantage MG White Cote Print, to its flexible packaging portfolio. Cote Print has ideal base paper properties owing to a totally new coating recipe and optimized calendering. Ready-made meals and sauces with high fat content and strong colours often have an undesired side effect on the packaging – they leave stains. As an attractive appearance and long shelf life are two key factors in convenience foods, Mondi set out to find a solution for this problem. The result is a new retort packaging that ensures highest barrier properties whilst sustaining opacity and enabling high-quality designs. With the launch of numerous new industrial bag constructions over the last few years, Mondi’s innovation strength has been internationally recognized by customers and industry awards. The latest innovations, process improvements, and certifications clearly put the focus on sustainable solutions from an environmental and economic point of view.